I was invited to meet up with Eugenia on a recent trip to London. Eugenia has been in charge of wine-making at Viña Vistamar only since the 2000 vintage and we tasted through her whole range, plus some previous vintages; some sixteen wines. I had the opportunity to ask Eugenia about herself, her winery and a little bit about how it was to be a woman winemaker in Chile. 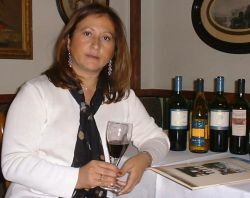 Having graduated from University, Eugenia was engaged in oenological research between 1982 and 1983, before becoming an advisor for the Ministry of Agriculture, where she stayed until 1989. In 1990 she began work at Viña Portal Alto in Chile, before joining the massive Concha y Toro in 1991. In her period there she was in charge of fine wine reserves and, in 1992, became winemaker for the Casillero del Diablo range.She joined Vistamar’s parent company in 1997.I asked Eugenia if she had experienced wine-making outside of Chile, and was surprised by the extent of her research. She has worked vintages with Château Carbonnieux in Graves, with Buena Vista Winery in Sonoma, California, and has travelled extensively on wine-making research in South Africa, Germany and, in 1999, Portugal. She says she has no ambition to join the ranks of the ‘flying wine-makers’. She found working two vintages – September in the northern hemisphere, then March in the southern hemisphere – to be a deeply frustrating experience: she felt as if she wasn’t really part of either team, and prefers the solidarity and close-knit working situation of making wine in one place. I also asked Eugenia about some of the newest varietal wines arriving here from Chile: the Gewürztraminers or Viogniers for example. She expressed her opinion that Chile should first of all consolidate and play to its strengths. Personally, she wants to concentrate on proven ‘terroirs’ and refining the wines that are made there from grape varieties that are already established. Based in Casablanca, the mainstay of Vistamar’s portfolio is Chardonnay, Sauvignon Blanc, Cabernet Sauvignon and Merlot. There are also plantings of Sémillon, Syrah, Malbec and Carmenère. Of here wines, Eugenia says: ‘the wines are like my children. I conceive them from the vineyard. I love to watch them develop from the vine stage onwards. The whole environment around them will influence their quality, just as each year gives its own distinctive seal’. Now, it is difficult to imagine a male wine-maker thinking of his wines as having been ‘conceived’ and I asked Eugenia if she had found any resistance amongst her workforce to the idea of a woman winemaker and boss. But she insists there has been no resistance from either her board of directors, or her workforce. What’s more, she thoroughly enjoys being boss (she was one of a team of 15 winemakers at Concha y Toro) and is pretty sure her credentials as a scientist, academic and oenologist are accepted as proof of her talent and skills without question. The tasting of Vistamar’s wines was not blind. A rough price guide and UK stockist information appears at the bottom of the page. I have to say, Vistamar’s brands need a little refining as they are confusing at present. Basically they have three ranges: ‘Subsol’ and ‘Southern Breeze’ covering both single varietal and blended wines which are priced only slightly differently, and the ‘Niebla’ range is Reserve level. Majestic stocks the Subsol range, but under an alternative label: Vistasur. A roughly 50/50 blend, this has a very attractive lemony nose, with notes of orange and fresh, creamy butter. A little toasty note too. Rich, full and fruity palate with fine ripeness and just a touch of heat in the finish from highish alcohol, but very nice. The blend here is approximately 60/40. The nose is fresh with crunchy gooseberry fruit and ripe, tropical notes. The palate fleshes out with good weight, texture and lemon and peach fruit, but the Sauvignon keeps it crisp and mouthwatering. Another easy to drink, very likeable wine. Quite a tropical style, with lots of lush, bright fruity aromas of pineapple and guava. Palate is sweetly-fruited but with enough broadening, generous acidity to balance. Delicious, open style. From Casablanca fruit, this has much more steeliness about the nose, with notes of leafy gooseberry fruit and hints of tropicality, but mostly it is crisp and citrussy. On the palate really very elegant with good grapefruit acidity, powerful fruit and good length. Balanced and with lots of style. Very good. Super-ripe peach and orange fruit on the nose, a touch of cabbagy over-ripeness. Very creamy stuff, full-bodied and buttery with sweet fruit and slightly hot alcohol. A simple style and foursquare, but a nice wine of its type. Good. Subtle, generous, toasty oak over nutty peach fruit. Lovely quality. On the palate quite full-bodied, though the palate doesn’t quite live up to the promise of the nose. Good. This wine is aged in three-year-old American oak barrels. The nose is spicy and soft, with attractive aromas of red fruits; strawberry and light, creamy raspberry. On the palate this has sweet fruit, but is not too jammy. Very clean and bright style, and though a little short, drinks nicely with no sign of clumsiness as often found in inexpensive Pinot. Good. Beautifully sweet and concentrated briary, berry and woodsmoke nose. On the palate it seems a little flat. Maybe just a touch corked? Creamy, fat, black fruit nose leads to a palate that’s surprisingly sinewy and structured. Quite a fresh, bright flavour profile that is juicy and shows just a touch of chocolate richness in the finish. Good. This has very ripe, juicy fruit on the nose: sweet raspberry and blackcurrant. There’s a nice acid structure to the red berry fruit on the palate and decent length. Good. I’ve yet to taste a poor Carmenère, and this is another winner: a firm, quite serious nose of blackcurrant and bittersweet black cherry. Really chewy fruit on the palate with good acidity and delightfully savoury tannins. Delicious. Very good. Big brother from Maipó Valley fruit and a year older, shows creamy black fruit and a schisty, gravel edge that adds lots of interest. Some toasty oak. Real depth and savoury structure on the palate with dusty tannins and good length. Very good indeed. Nice nose, showing a firm black fruit character which is quite cool and classy. A firm style, with blackcurrant and morello cherry. Good juicy acidity, perhaps a little short, but fine. Good. Very ripe nose, almost a little minty, eucalyptus quality, plenty of fruit. On the palate ripe and sweet black plum, blackcurrant and blackberry, good acidity and fine tannins to back it up. Structured and savoury, this has fine balance and good length. Very good indeed. Fresh, breezy, crisp fruit. Lots of ripe, fresh, bursting cherry. On the palate there’s a surprisingly chocolaty richness of bittersweet fruit. This has decent length and stays juicy and focused, quite mouthwatering. Very good. This is a barrel sample, as the wine is not yet bottled. Again, fruit for this wine comes from the Maipó Valley. Super-ripe, soft, lush nose, lots of mint and eucalyptus, plenty of blue-black dusty fruit. On the palate the tannins are ripe and there’s a lot of toasty, charry coffee-bean oak. This has a chunky quality at present, but should be very good indeed. excellent potential.